Click on each picture to get to the purchase link of the buttons. 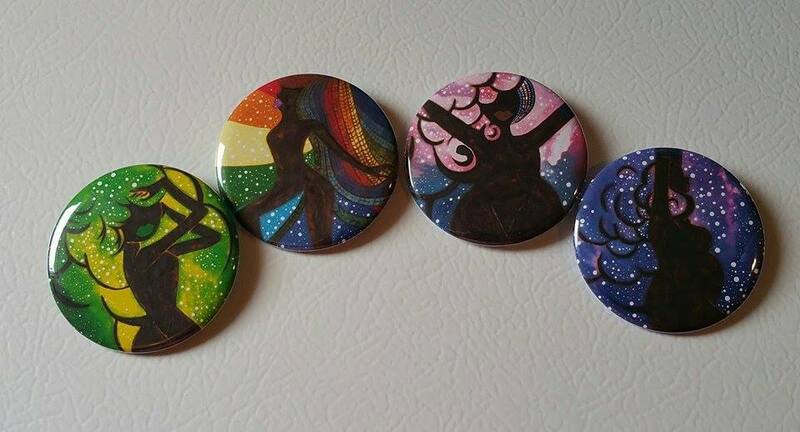 Each button is $3, or you can get the set at a discounted price! Cosmic Green: Bree always has her bow in plain sight, but no one suspects the power within it. With a confident shout of, “Cosmic Green: PRESS START,” the bow gets a retro look before the ribbon surrounds Bree in green, pixelated bits that meld into her hair. Radical Rainbow: When it’s time to transform, Lonnie closes her eyes and calms herself to prepare for the battle at hand. “Radical Rainbow: Let’s Kick It,” she says before she kicks her leg out. Her rainbow colored anklet snaps off and each rainbow color swirls around her to form a powerful rainbow. Galactic Purple: When it’s time to defend the city, Marianna thrusts her hand into the air and cries out, “Galactic Purple: Rise Up!” Her bracelet then breaks apart and the pieces swirl around her, her hair shifting into a brilliant, star covered purple as the transformation begins. This set was made by Nozomi Neko and depicts each of the girls in an adorable, chibi style. They’re names are around the edge of the button, and are in their respective colors.